Amidst the cold torrential rain here in the UK, spring feels like it's almost, possibly here, so I thought this new pattern by September House fitted the bill. I love the rainbow trim on the dress and the little scottie dog! 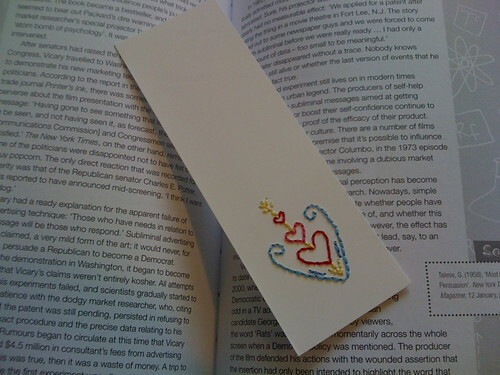 As for this week's featured free pattern, well I believe hearts are not just for Valentine's and I think this embroidered bookmark, stitched by Flickr user Awe Lisa, using a Sublime Stitching free pattern, looks very cute and if you read Awe Lisa's blog about where she left the bookmark, I think it must have made a very sweet surprise. I love the little girl with her pup. That is so adorable! The reverse applique is so beautifully neat, I am in awe. Love the design too. 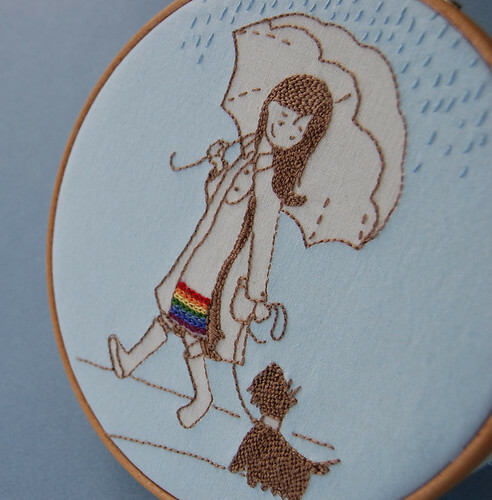 absolutely beautiful stitching on the girl and her pup! Love it! Lucky me!! I found the Quilt Dad blog which led me to yours. Turning out to be a great day! Love the little touch of rainbow!